You have so many places in LA to cool off at night with seeing a movie & concerts outdoors, here's another in Woodland Hills. 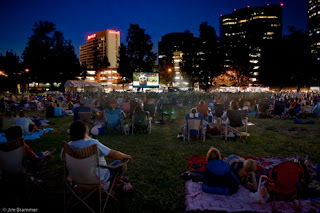 Pre-feature entertainment begins at approximately 7:15 PM and movies begin at dusk (approximately 8 PM). Parking for Movies on the Green is available for $10 in the adjacent parking structure on Califa Street, between Owensmouth Avenue and Topanga Canyon Blvd. Parking fees are retained by VCC and helps offset our production costs.